Between the Edge’s shredding solos on the iNNOCENCE + eXPERIENCE Tour and Pink Floyd guitarist David Gilmour’s major announcement that he would return to the US on a solo tour in 2016, we’re ready to declare that the guitar player is making a comeback. Okay, maybe the sweet sounds of the six-string have never ever gone out of style. But this got us thinking about all the astonishing guitarists on tour this year. Below we’ve rounded up 13 of the best guitar players on the road today — with awesome seats still available. This “Comfortably Numb” guitarist is anything but, and you can feel his fiery passion and stunning precision on each scorching lead. From the prickling echoes of “Us and Them” to the searing licks of “Shine on You Crazy Diamond” to the acoustic folk of “Wish You Were Here,” Gilmour has galvanized some of the most popular guitar sounds of all time. Fresh off recording his fourth solo album Rattle that Lock, he’s bringing the heat for his solo tour next spring. Known for playing an eruption of notes with the incredible tapping technique he popularized in the late ‘70s, Eddie Van Halen will always be a guitar god. After reuniting with original Van Halen singer David Lee Roth, fans everywhere want some of their world-class heavy metal. They’ll be playing all their biggest hits—including “Jamie’s Crying,” “Hot for Teacher,” and “Mean Street”—meaning fans are clamoring for tickets to their electrifying performances. Widely considered one of thrash metal’s leading guitarists, Metallica’s Kirk Hammett has shredded his way into the hearts of headbangers around the world. His technical mastery and lighting fast attack on tracks like “Enter Sandman,” “Master of Puppets,” and “Nothing Else Matters” are unmatched in their sonic savagery. Almost 35 years into their career, Metallica still unleashes an unrelenting sonic onslaught, and you can expect a pummeling display of power wherever these metal monsters play in concert. Very few guitarists can match the soulful intensity Carlos Santana brings to the stage on classics like “Black Magic Woman,” “Oye Como Va,” and “Europa.” His smooth style and scorching leads brought Latin music into mainstream consciousness as he freely fused blues, jazz, and mambo styles with his groundbreaking namesake band in the late-‘60s. With their 2014 album Corazon still fresh in fans’ minds, Santana is ready to bring their passionate fusion style to audiences at House of Blues Las Vegas and across America. Flamboyant blues maestro Buddy Guy has been burning it down for over 50 years, pretty much redefining blues while soloing on tracks like “Damn Right, I’ve Got the Blues,” “My Time After a While,” and “Stone Crazy.” His influential style can be heard when you listen to legends like Jimi Hendrix, Eric Clapton, and Stevie Ray Vaughan, who all borrowed from his passionate playing style in their own ways. Knocking on 80, Guy still brings his signature polka dot guitars, unbridled passion, and howling vocals to stages across the country. 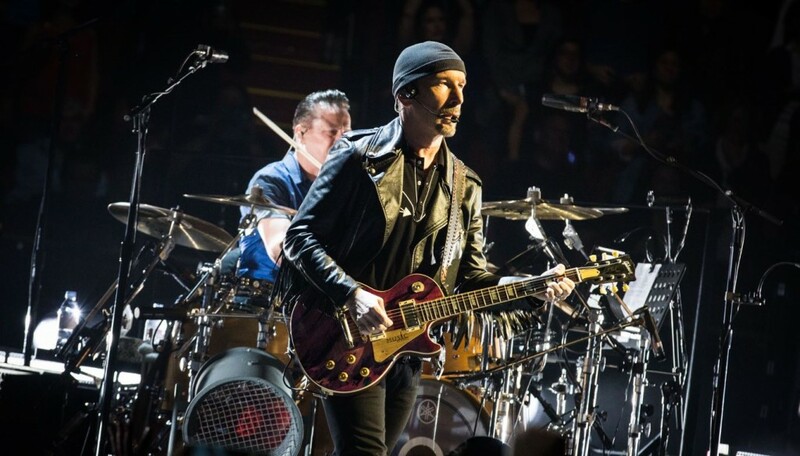 The Edge is likely to bring fans to the verge of tears with his unique guitar atmospherics, and his influence on U2 hits like “Where the Streets Have No Name,” “New Year’s Day,” and “Sunday Bloody Sunday” still echo throughout popular music. You’ll have a great opportunity to witness his sonic mastery for yourself as U2 embarks on their iNNOCENCE + eXPERIENCE Tour bringing their spiritually uplifting message and undeniably beautiful music to fans around the country. Rocking a beard and guitar tones as big as his native Texas, Billy Gibbons of ZZ Top is a guitarists’ guitarist if ever there was one. He’s known more for his tasty licks on hits like “La Grange,” “Sharp Dressed Man,” and “Legs” than how many notes he can fit into each second. You won’t want to miss Gibbons and Co. sporting their larger-than-life style on tour with specials guest Blackberry Smoke all over North America this summer and fall. Welcome to the jungle! When heavy metal was all about how fast your fingers could fly across the strings, Slash came along with the singing sustain of his soaring solos on Guns N’ Roses classics like “Sweet Child O’ Mine,” “Paradise City,” and “November Rain.” Now he’s playing favorites from GNR and his solo career with his inimitable guitar mastery all across the country to satisfy your appetite for destruction. With red hair to match her red-hot licks, Bonnie Raitt always gives audiences “Something to Talk About”. The blues singer is bringing her sultry voice and sizzling slide guitar style to cities around the country, playing hits like “I Can’t Make You Love Me,” “Not the Only One,” and “Love Sneaking Up on You” much to the delight of blues and rock aficionados everywhere. Riot Grrrl Carrie Brownstein doesn’t hold back during Sleater-Kinney concerts, delivering tons of angular riffing and feminist power on classics like “Dig Me Out,” “Call the Doctor,” and “Little Babies.” After an eight-year hiatus Sleater-Kinney stunned the world in 2015 with the comeback album No Cities to Love, and they’ll please indie mavens on every stop of their blockbuster reunion tour. The brooding Smashing Pumpkins frontman has been known to lay down some serious fuzz-driven riffs on hits like “Tonight, Tonight”, “Bullet with Butterfly Wings”, and “Cherub Rock”. Audiences are in for a treat, since they’ll get to see Corgan shredding with the Pumpkins on The End Times Tour as co-headliner and shock-rock superstar Marilyn Manson joins the mayhem. Those bearing “Digital Witness” to St. Vincent’s visually stunning and aurally amazing shows know that this singer-songwriter can lay down some freaky, robotic licks. She handles everything from headbanging anthems like “Rattle Snake” and sentimental ballads like “Strange Mercy” to subversive pop romps like “Cruel” with a performance art mentality and stunning showmanship that always blows fans away. Tell us your all time favorite guitarist that you’ve seen play live.